SnapCacklePop: MTV get serious on Brand New talent..! MTV get serious on Brand New talent..! Not one to miss out on the rise of the talent search competition, MTV has launched its own format in Brand New. The competition allows the public to vote online for their favourite emerging Aussie or Kiwi act, whilst MTV gives the artists the support and exposure they need to break through onto the music charts and make it big in the industry. The competition follows on from the continued success of MTV Brand New in the UK, which put popular artists such as Sam Smith, Florence & the Machine, Adele, Jessie J, Charli XCX and most recently James Bay, onto the international scene. Yeah that sounds awesome but how does it work. Please don't say we will get more famous judges like the Delta vs Jessie J coverage??? Um No. Basically its up to you!! 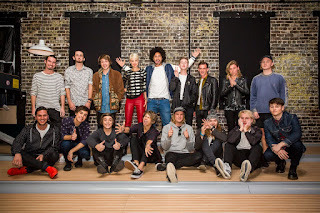 You can visit mtv.com.au/brandnew to view video clips and interviews with the artists before casting their vote for their favourite emerging star, either online or via Twitter using the hashtag #MTVbrandnew followed by the artists name. The competing artists will battle it out over ten weeks beginning July 6, with voting closing September 13. We think this will be an interesting comp, as all artists are unique in their own way. We have our favourites all ready and may have few exclusive interviews lined up for you pop fans so stay tuned. Until then check get voting on mtv.com.au/brandnew now..!